How to fix pearlizer swirls? it's whiter swirls in finished products, even though pearlizer doesn't seem to separate or precipitate. I don't know what the pearlizer contains. It's a whitish cream or light paste. 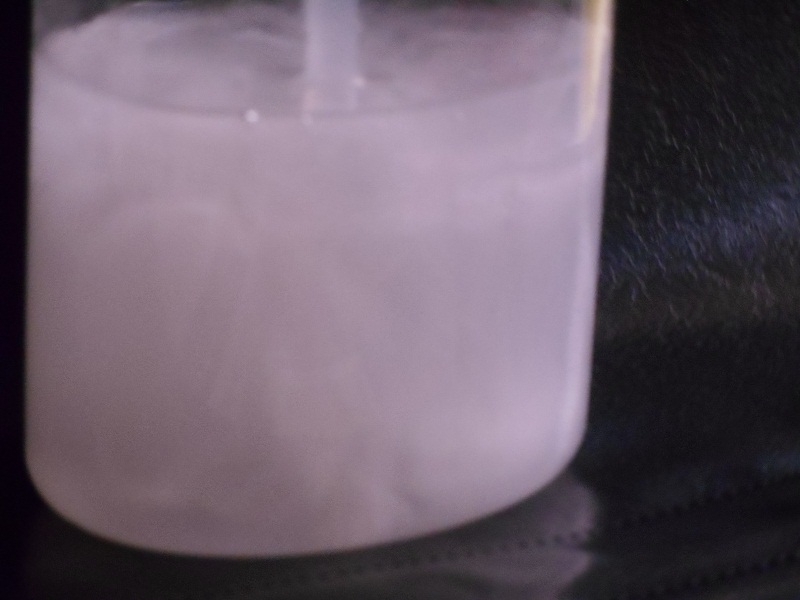 I also tried pre-mixing said pearlizer with Cetiol HE (PEG-7 Glyceryl cocoate), but as soon as I add water, swirls appear. but on stirring, pearl swirls appear again. Tried heating it when mixing too, to no avail. I tried purchasing pearlizer from another local supplier, but they might be the same product, from the same manufacturer, just different retail packaging. Would an emulsifier or solubilizer help? Sounds normal to me, isn't that what pearl is supposed to do? you can see some whiter clouds leaving a trace, which seems to remains in place. As Belassi said it sounds like normal behaviour from a pearlizer. Do you have any photos? Pearlizers are dispersible in surfactant systems, but not soluble which creates the "swirl" effect. To reiterate the comments above ... sounds normal and like your pearlizer is doing exactly what it is supposed to do. This is an image of one of our pearled shampoos. The pearl provides, in combination with coffee and suspended licorice, a metallic bronze effect. Pouring it into the hand, as in the shower, pearlescent swirls are created in a most attractive manner. This particular product uses 3% Euperlan PK-771 (a cold process pearl). This was an early version, we now have a properly designed label for it, but the visual effect is still the same. That picture isn't clear, but that's how it usually looks. If you don't have cationics in your formula you can throw some styrene/butadiene to make it opaque. (I take that's a shampoo or a hand soap). And it looks like you are using too much. I use it at 0.001% and the pearl effect is noticeable. it has some large clouds and swirls in it. The manufacturer brochure for Euperlan PK 771 Benz, says it's cold-processable, and advises 3-10% concentration. The pearl effect isn't regular, that's the beauty of it. If you want to make it white and shiny this is not the way. That is exactly what it's supposed to look like. Add color to it and you will notice the difference. Agreed, this is on par with the look we get with pearlizers. The pearlizing agent in Euperlan is Glycol Distearate. I am assuming that your surfactant mix is clear, transparent before you add the pearlizing agent. If you want a solid white pearlized product, just add 1% Sucrose Stearate ( Sisterna SP70-C ) to the water phase ... it will make your aqueous phase solid white without increasing the thickness. You will then have a pearlized solid white product. and some swirls from Euperlan PK 771 remain, and it made the product lighter. @Belassi did you mix Euperlan with some solubilizer or something? Do you add it at the end, cold or hot? I simply mix 3% in at the end of the process, when the batch is around 40C or less. It disperses very easily. Is yours a white paste? How easily does it disperses? Does it initially forms white clumps. but packaged for retail, so IDK if that was real BASF, or copycat chinese. I'm glad I didn't buy the whole drum, because this is the second pearlizer I tried that doesn't seem to work fine. Does yours says BENZ too? I believe I got the 90s Ford Taurus version instead. All with its transmission problems, lol. No, it is a thick white liquid. Doesn't say BENZ. It disperses really easily, I don't even need to use a mixer, just pour it in at the end while stirring by hand with a large stainless paddle.